For The Global Light Sweet Crude Oil Market. "Research: A strong downdraft in the USO's 2 year backcycle occurred this week in 2009, it's bottom establishing a focal point for the current recovery uptrend. The strong downward extension two years ago WITHOUT SUFFICIENT ECHO actually FURTHER STRENGHTENS the upward price vector pressure forward, ceteris paribus, within our forecast and analysis model, starting with the completion of this phase (on Monday) of the 2-year price cycle input. See blue 'recovery support vector' illustrated from Feb09 forward. See upvector strength of 2-year vectors, as illustrated, and directly delineated in green: Feb-Nov07 and Feb-Nov09 echodates. Potentially strong seasonal cycle, the six month echovector, and the 2-year cyclical upward price pressure are forming and converging, ceteris paribus. Observations add to validity of the long opportunity forecast, and the conservative straddle opportunity forecast. Price reversal potentially forming in $35 dollar price range. Further Opinion: Hedging potentially forming upward pressure on domestic gasoline prices, to protect against the potentially forming upward price potentials in gasoline, and their realization, which can follow Monday's convergences, is considered, ceteris paribus, valid. EG: $10K into USO at $35 will be worth about $13K at $45, should a reversal this season at about $35 take place, and prices go to $45 sometime before mid-November. 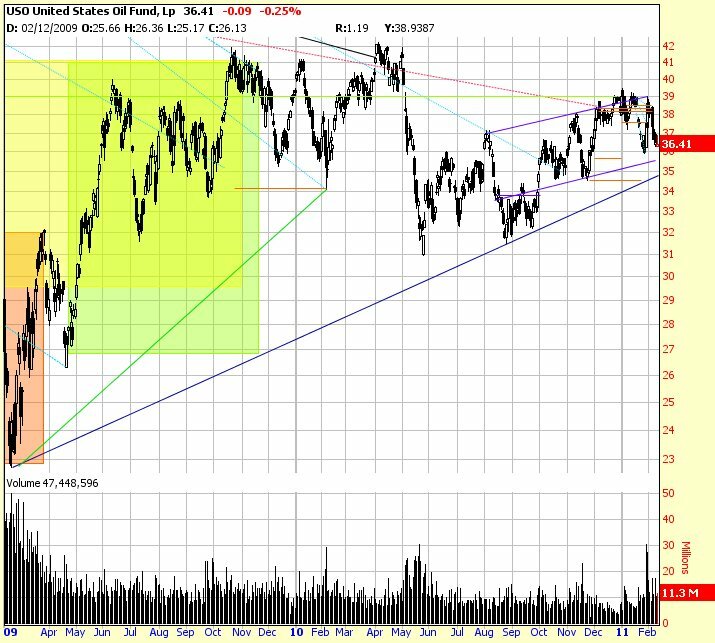 X factor: Events contrarily leading to a fall in gasoline prices would further support the industrial securities market base; and, potential inducement of industrials share price advancement, ceteris paribus, in those markets could then offset the price of the USO hedge, in whole or in part. Additional USO energy holdings could hedge against other share price and commodity price inflations, aggregated, in general, as well. Demand-pull and cost-push inflation hedge." Observed Confirmation, Tuesday 22 Feb 11: The researched and forecast opportunity for USO acquirement in the $35 price range last week, from the prior week's $36-37 price range, with strong price compression and vector convergences forecasted, and a 'reactive price updraft following', has been confirmed (and has take place). The USO has traded over $45 on several occasions since the bmra.mdpp ALERT on the USO was first issued in February 2011. This bmra.mdpp USO Alert forecast a buying opportunity occurrence for the USO in the $35 price range during the trading week beginning February 14TH 2011 (with an initial price target 'closing opportunity consideration' at $45 also forecasted to likely occur within two months thereafter). After meeting these bmra.mdpp forecasted time/price targets, on April 8 2011 USO traded as high as $45.18. Additionally, USO traded above $45 last week on certain days. bmra.mdpp is pleased it was able to provide, on a limited basis, this USO research output and product, and these first and second USO Alerts, back in February. Disclaimer Note: Although bmra.mdpp strives to provide the most useful and timely research and information, bmra.mdpp does not guarantee the validity nor the reliability nor the use-ability of any of its distributed or disseminated forecast model product or output. Any utilization of its product or output, or included or attached statements, illustrations, information, suggestions, or strategies, whether explicit or implied, by any reader or persons or legal entities, and used by such reader or persons or legal entities, in any manner, shape, way, or form, or for any and all purposes, is solely the responsibility of such readers, persons, or legal entities, so utilizing the product or output." constitutes a 28% capital gain in the USO realized in less than one quarter year. A prior recognition of North American crude oil's efficacious 2-year cycle mid-summer 2-year EchoVector toppy-ness was made back in the early summer of 2009. July 11TH was recognized and forecast as a 2-year EchoVector (2AEV) top at $117.40 on the USO with a full short potential, and was accompanied by a 'timing' sell trigger 2AEVEDT (2-year EchoVector EchoTradeDate) for early to mid January 2010. Although many Crude Oil Analyst were recommending long positions in the USO last month as we enter into the hurricane season, with Gulf oil production seasonally vulnerable, MDPP has no current Forecast Opinion on the USO. Is Seasonal Price History Unfolding Again? 4. Be aware of momentum reversal at the end of September and the beginning of October, following the downside price consolidation. 5. Be aware of 'the about one Quarter's earlier in time' momentum bottom occuring at the end of June/early July. Note that the reversal is good for price updraft for the first month, of three subsequent months (up-down completing in October) and failing (beginning down around the beginning of August. This forms a cone with June/July and Sept/Oct bottoms with an August 'pointed top'. CCEV, AEV, 2QEV, and QEV Forecast Bases Weighted Price Target Alert. 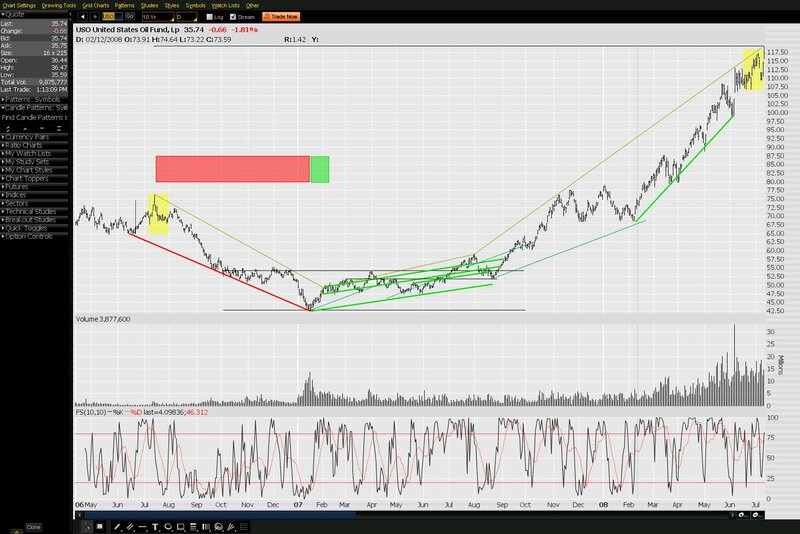 4/30/12 A Current USO ETF EchoVector And EchoBackDate Price Analysis:Is Seasonal Price History Unfolding Again? USO ETF: Price Insurance Application ALERT for Next Week. Copyright 2012-2016. PROTECTVEST AND ADVANCEVEST BY ECHOVECTORVEST MDPP PRECISION PIVOTS. All Rights Reserved.